The Cultural Management Academy is a post-graduate program for cultural management aiming at capacity building and stimulating exchange and collaboration in the Balkans and South-Eastern Europe. It is organized by the Goethe-Instituts in Sofia, Bucharest, Thessaloniki and Sarajevo. 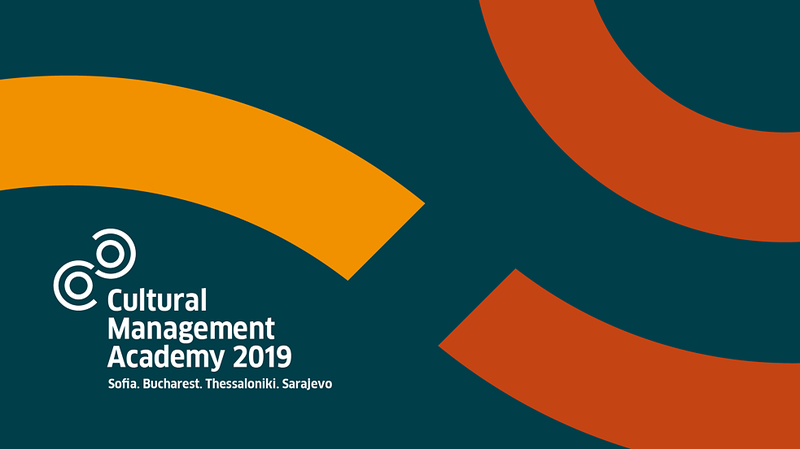 The Goethe-Institutes in Sofia, Bucharest, Thessaloniki and Sarajevo0pleased to announce an open call for participation in the Cultural Management Academy 2019. The CMA this year is dedicated to the topic „Culture and arts in transition: the digital era“ and will explore new technologies and their impact and use in the management of cultural institutions and cultural projects. The Academy offers participation in the CMA Network Meeting & Idea Camp taking place in July in Plovdiv - European Capital of Culture, and in an intensive one-week seminar, taking place in autumn 2019 in the country of origin/residence of participants. In order to support the capacity building process, the CMA offers possibilities for start-up funding of new collaborative projects through the CMA Fund. The CMA 2019 will be officially launched in the European Capital of Culture - Plovdiv. All participants in this year´s edition of the CMA will gather to network and to reflect on the topics of „Culture and arts in transition: the digital era“, „European capitals of culture in the region of South-East Europe“ and „International collaboration and role of the EUNIC clusters“. The program design developed by Yanina Taneva and Ideas Factory (Sofia) will encourage sharing, collaboration and exchange and will create a space for developing new project ideas. The CMA Project Fund was established in 2017 as continuation of the capacity building process of the CMA. Its aim it to provide participants more space to develop new ideas, to collaborate with other managers from their and other countries in the region. On that way the CMA is aiming at establish a capacity building model based on theory, practice, creativity and collaboration. - Closed call 1 (July): Up to 5 of the projects developed at the Network meeting in Plovdiv will be provided up to 5000 euro. - Closed call 2 (September-October): After the local seminars in autumn 2019 the CMA provides further possibilities for micro funding (up to 500 euro) for small projects/events, mobility etc. In each city will be offered a local 1-week seminar for the participants from this country. The seminars will include lectures, workshops, trainings and other capacity building formats dealing with the topic of the CMA in 2019 - „Culture and arts in transition: the digital era“. The program of the seminars is curated by local professionals and build upon the specifics and challenges of the local cultural scene. Trainers in the seminars will local and international professionals from the field of cultural managements. The local program is curated by Goethe-Institut Bulgaria in collaboration with Yanina Taneva, Ideas Factory. © Photo Corps Over 150 cultural managers from Bulgaria, Romania, Greece and Bosnia and Herzegovina took part in the CMA since its start in 2015. We have had representatives from public instituions, museums, private organisations, NGOs and informal groups. © Photo Corps Over 50 top specialists in the field of cultural management and cultural policites (both practitioners and academics) from Germany, UK, Austria, France, Poland, Spain, Czech Republic, Greece, Bulgaria, Bosnia and Herzegovina, Romania took part in the CMA as lecturers and trainers. © Photo Corps Since 2017 the CMA has been providing startup funding for new collaborative projects and initiatives. Participants in the CMA are encouraged to network and develop new ideas with their colleagues - both from their cities and from the other participating cities. In the end of the CMA all participants take part in a network meeting and an "idea camp" in Sofia. They can build small teams, develop new project ideas and apply for funding of up to 5000 euro. © Goethe-Institut Bulgaria Every year we have an open call for papers on a particular topic related to cultural management. The selected papers are then published in the annual CMA Publication. You can now downloard for free our first publication from 2017 dedicated to the topic "Paths to innovation in culture". The program of the CMA culminated in an international meeting and a networking fair in Sofia, bringing together all participants from the participating cities as well as local and international guest-speakers. In 2018 the conference and CMA network meeting took place from 27-30 September.